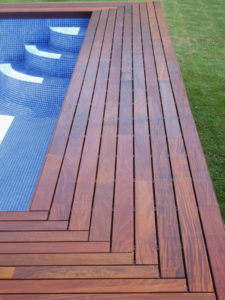 Any material you use for the pool surroundings is called decking. But authentic pool deck building is with wood. It makes sense if you think about it. Wood is a natural product and thus fits right in the natural environment. No matter which wood you choose, it will not seem out of place. On top of that, there are all sorts of choices. You can opt for cedar, mahogany, or ipe deck building. Regardless of what you select, remember that wood can be treated, coated, and stained. But you need to understand that wood needs regular maintenance. Depending on which species you choose, wood must be sealed to remain waterproof. And this brings us to another major concern. Before we dig deeper in any safety concerns, let us point out that pool decks are exposed to elements more than your patio custom decks. They are nearby a large body of water and don’t forget that you will walk with wet feet on the wooden deck. And then it’s a matter of the weather. Too much sun in the summer, freezing temperatures in the winter. Wood reacts because it’s natural. And so both deck construction and installation must be done right. Some wood species might require a period of time to weather. And then when your pool cedar custom decks are installed, they must be slightly sloped. Ask yourself, where will all the water shed on deck will go? And then it’s rain water and melting snow. Water must have a way of sliding off your deck so that wood won’t decay prematurely. These considerations are important for your safety too. One of the most important things to keep in mind when designing your pool decking is slip-resistance. By nature, wood is not slippery but this will also depend on coatings. So avoid glossy ones and prefer textured surfaces that are not slippery. If this is an above the ground pool, consider deck railings. This is significant, especially if you have children. You don’t want any accidents because someone lost balance or slipped on the deck. 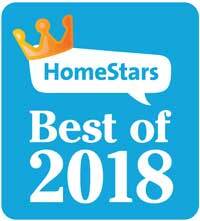 What else should you consider before ordering pool custom decks? Your feet. Ask your deck contractor to give you solutions that won’t burn your feet. After all, you use the pool when it’s hot. Bare feet on hot decks is an ‘ouch’ combination. And although you cannot avoid it altogether, remember that darker colors get hotter faster under the sun. From ipe and cedar to pressure treated decking, all wood options are fine for the pool area as long as you stain them properly and maintain them regularly. But as an overall wood has many advantages and with the right planning from the start, your pool area will not only be stunning but safe too.